The first-generation of AirPods was one of the hottest selling headphones over the last couple of years. And recently, Apple released the second generation of the AirPods 2 wireless earbuds with a number of improvements over its predecessor — which was released back in 2016. The second-generation AirPods were announced in the same week that the iPad Air 3 (Check out: iPad Air 2 vs. iPad Air 3) and iPad mini 5 (Check out: iPad mini 4 vs iPad mini 5) were introduced. Apple’s second-generation AirPods are simply called AirPods. But to make the comparisons easier to understand, it will be referred to as AirPods 1 (first-generation) and AirPods 2 (second-generation) in this article. The design of the AirPods 1 and the AirPods 2 are almost identical. The AirPods 1 and the AirPods 2 both look like the EarPods that come with iPhones and iPods, but without the wires. And the charging cases still look like a dental floss case. Previously, there were rumors that Apple would offer a different color option, but that did not pan out. The AirPods and charging case are still both white, but there are third-parties that offer AirPods in different colors. So this is good news if you are a fan of the original design. 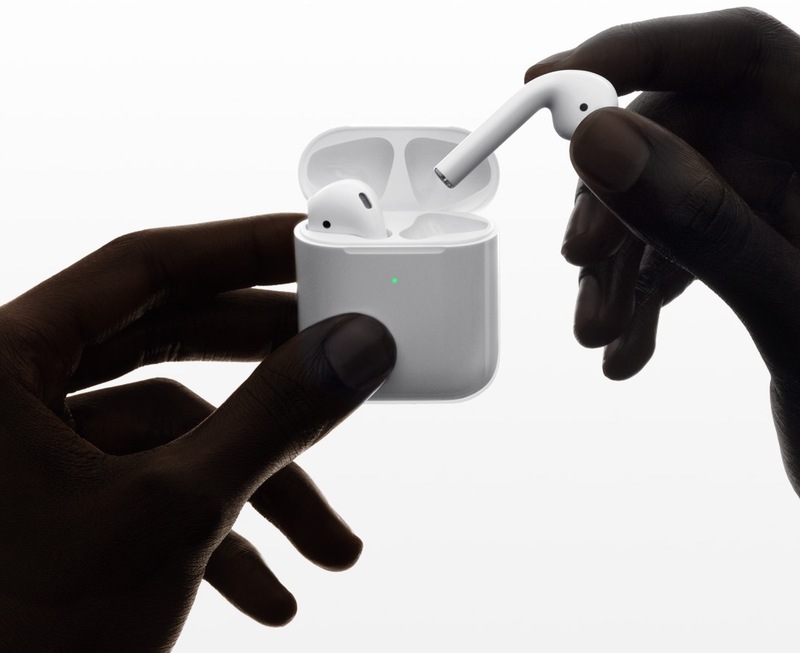 In terms of dimensions, the AirPods and AirPods 2 are both 0.65 x 0.71 x 1.59 inches (16.5 x 18 x 40.5mm) / weight 0.14 oz (4g). And the dimensions of the charging case are 1.74 x 0.84 x 2.11 inches (44.3 x 21.3 x 53.5mm) / weight 1.34 oz (38g). The retail price was the same for the new AirPods compared to the first-generation. However, I would expect the price of the refurbished models of the first-generation AirPods to come down. The base price of the first-generation AirPods and the second-generation AirPods were both set at $159. For the AirPods 2, this is the price with a charging case that has to be plugged into a Lightning cable. But you can buy the AirPods 2 with a Qi-based wireless charging case for a price of $199. The price of the wireless charging case sold separately is $79. These products are available at Apple.com, the Apple Store app, and the retail locations. Inside of the AirPods 2 is a new H1 chip that includes a “custom audio architecture.” The H1 chip in the AirPods 2 is faster and more stable than the W1 chip in the AirPods 1. This is impressive because the W1 chip in the AirPods 1 is already seamless. But the AirPods 2 also connects from one active device to another twice as fast as the AirPods 1. Apple made substantial improvements to the audio experience in the AirPods 2. The call time in the AirPods 2 has been extended with 50% more talk time. And there is lower gaming latency — which is driven down by up to 30%. So you should have a better audio experience while playing games on iOS devices. One of the advantages that the AirPods 2 has over the AirPods 1 is the “Hey Siri” feature. With the AirPods 1, you would have to double-tap the AirPods to activate Siri. The AirPods 2 allows you to activate Siri by simply saying “Hey Siri.” From there, you can ask for directions, make phone calls, control music, adjust the volume, etc. Unfortunately, not much has changed with the battery life of the AirPods. With a single charge, you will get five hours from a single charge. And when you put the AirPods back in the case for fifteen minutes, you will get three hours of music playback and two hours of talk time — which is the same as AirPods 1. The LED indicator indicates when the AirPods are charging. And the charging case provides over 24 hours for the AirPods. It’s also worth mentioning that the AirPods 1 is backward compatible with the new charging case. And all of the cases can still be charged with a Lightning cable, including the wireless version.